If I hear the words ‘well there will be a really good reason why you didn’t get that acting job. There will be something else just round the corner‘ once more I am going to commit murder. On myself. When you tell us that we didn’t get it because we are going to get something else it’s rubbish. Basically. And drives us mad. Ok me mad but I can’t be the only one?! Strangely I have never heard any actors that have been in showbiz as long as me say it. They know better. Well the unsuccessful ones do anyway. It’s OK to say those fatal words to cheer a performing pal up when they are just starting out. You know the first 10 or 15 years or so. We are still also full of optimism. We also firmly believe that the reason we didn’t get that amazing role in a prime time drama was because we were ‘supposed’ to do something more meaningful, more serious, Shakespeare or something like that? The fact that we don’t even like or know anything about Shakespeare doesn’t deter us…. Oh no it doesn’t! The fact that it was a primary schools tour presenting Macbeth as a comedy to warn kids about swimming in reservoirs doesn’t make us bitter. No, we watch that drama in our crappy digs in Sunderland and think ‘wow…. I am so so lucky I got this schools tour instead of that’. But I digress. Back to moaning at you about trying to make me feel better about the job. You know when it’s been 20 years and you are still bailing out £100 to get to a casting, losing twice that in loss of wages and child care you get a bit….. Oh what’s the word?…… Bored? Not bored with the casting. Oh no. Full of excitement about that still. In fact you are that good an actor now you nail every single audition. You don’t even have to think about a dead relative to make yourself cry in the casting. You are that good an actor nowadays just reading the script and ‘becoming’ the character does it. You are so experienced and talented you can learn all the lines on the train on the way there….. Really you should be working. All the time. If you could just get a job. But you don’t get the job. And then nothing happens in the 6 months after. You don’t get a call from Hollywood. There is no amazing opportunity, no incredible job. The best we can hope for is a voice over job for Aldi…. At least we can pay the tax man then! So no! When you tell me I didn’t get that fantastic theatre job over the summer I just don’t believe you when you tell me it’s for a good reason. I have used that excuse for 20 years and have stopped believing it! So what do you do? Give it up? Call it a day? Call your agent and say ‘that’s it! I have had enough. I can’t take ANY more. Maxine Peake has stolen my career without my permission and I am never ever gonna work again’. I can’t do that. Instead what I am gonna do is go watch her in Striker and then wait and ask for her autograph……..but then push her down the stairs outside the Royal Exchange. Ok well maybe that’s going a bit far. I really hope no one actually does that as I love her! Leave Maxine alone. Please don’t harm her. 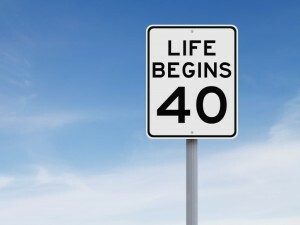 No I think what we do when we turn 40 is we say ‘right this is it…. I wasn’t ready for it before. I wasn’t in the right place. I am ready now. Bring it on suckers’ . And you throw more money at Virgin trains, you get a showreel done to remind you how good and young and fearless and beautiful you used to be, you get some headshots to show the ‘new’ you and you wait for that lovely caller ID to pop up on your I phone…. AGENT CALLING. And you start all over again. If you are an actor. If it’s in your bones. That’s what you do. Till you die. PS It’s not all doom and gloom, I have been well and truly swept of my feet and am no longer a SINGLE resting actor. And what’s more the GF thinks I am the next Sharon Stone. I haven’t got the heart to tell her the truth. PPS I never did an Aldi voice over, I would never push anyone down any stairs and Meladrama does not condone any violence to other actors in the pursuit of your own failing career. Except perhaps Miranda Hart. If you can do something that means I never have to see her again that would certainly enable me to cut down on the meds. Oh and the AGENT CALLING never comes up. She’s saved in my phone under her first name. But then she is my therapist too sometimes….. she’s a diamond.